My wife and I are approaching nine years of marriage and I can’t remember ever having a big fight about money. Sure, we bicker about little things occasionally. Who doesn’t? In an era where financial issues are the second leading cause of divorce, I’m proud to say that this is one thing that has never been a significant issue. So what’s our secret? The main reason is that we’ve never been in a dire financial situation on the verge of bankruptcy or anything even close. However, I believe a secondary reason is because we’ve ignored all of the advice about having a joint bank account. Should You Get A Joint Bank Account? I’ll be honest, I’m not sure how much I love the word “forces”. I’ve always been someone who wants to fully understand the “why” in something, and the harder someone forces me to do something when I don’t understand the why, the less likely I am to do it. My wife is the exact same way. Call me crazy, but I think being aligned with money is very possible without a joint bank account. Ultimately, it comes down to what works best for you and your family. Throughout our entire debt paydown journey, our premise has been to focus on the big things and let the small stuff slide. In many households, housing, transportation, and food account for about 70 percent of the budget. So our thought has always been that if we can keep these costs reasonable, we don’t have to be perfectly aligned on the small stuff. Similarly, I don’t really see a need for my wife and I to communicate about every trip to Starbucks or decision to buy a beer or two at happy hour after work. My wife and I are both first-born fiercely independent millennials who like to have some financial space. I’d say that we’re both natural savers instead of spenders so we have never had issues making this work for us. This doesn’t mean that it will work for you and your family, but you also shouldn’t feel guilty for not having a joint bank account. Bottom line, do what works best for your family. If there are trust issues, or if one partner is a big spender and needs some accountability, then by all means go for combined accounts. This is not a recommendation against a joint bank account; it’s simply an alternate to the status quo. I believe it’s possible for a couple to be united financially while having separate accounts. We have three simple rules that allow us to stay aligned with money. 1) We are not allowed to take on significant credit card debt. In addition to our own bank account, we also have our own credit cards. It’s not uncommon for either of us to carry a small balance that usually gets paid off within a month. We hold each other accountable by sharing when we are in a situation where we can’t pay down our balance in a reasonable amount of time, then try to help each other out. 2) Even though we have our own accounts, we still discuss major purchases. We do not have an exact threshold, but it usually ends up being anything about $200 or $300. As you’ll read below, many of the larger purchases come out of our savings or from my account given the way we’re set up. 3) We let each other know when money is tight. At least once a month one of us is asking the other how we’re doing with our money. We’ve grown to just kind of know when one is in better shape than the other. Our family sometimes teases us about deciding who is going to pay for dinner. Since this is a discretionary expense we just kind of figure it out. It’s never been that complicated. My wife got her first teaching job in 2012 a few years after we were married. While she was in school I paid for most of the expenses and she worked a bit on the side for her own spending money. After getting a full-time job that paid decent, we sat down to sort out our expenses. I don’t remember exactly what our take home pay was at the time, but my checks were about twice as much as hers. For simplicity let’s say that she made $1,500 and me $3,000. Our goal in all of this was to agree on the amount we wanted to save or use to pay down debt and ensure we had roughly the same amount of spending money left over after bills were paid. We’ve never kept a budget. However, we’ve used for years what has been coined as the anti-budget by Paula at Afford Anything. The first step in our process was to write down all of our regular expenses. This included mortgage, student loan payments, internet, groceries, gasoline, day and anything else that we paid for on a regular basis. We did not include costs related to entertainment, going out to eat, or other random expenses. After writing down our regular expenses, this gave us an idea of how much we could dedicate to either giving, saving, or additional debt payments. When we first started out, my wife was still in school pursuing her teaching certificate. We weren’t able to put much of anything towards any of these categories. When my wife got her first teaching job, instead of increasing lifestyle inflation, we lived on the same budget and put almost all of her salary towards paying down the $50,000 in student loans that we had accrued. As our salaries increased over the years, we steadily threw more money at our debt and built an emergency fund. More recently, we have been trying to give more of our money away as well. If you are using the anti-budget method, the most important part is that these payments come out of your account as soon as you get paid. If you wait to see what’s left over at the end of the month to make debt payments, I promise there will be nothing left unless you are on a strict budget. What is slush money? This would include anything that isn’t a regular monthly expense identified in steps 1 or 2. This may include going out to eat, tickets to a sporting event, grabbing a latte from the local coffee shop, buying a wedding present, or any other random or infrequent expense. The most important thing here was to ensure that our slush money was the same. Even though my income has always been higher than my wife’s, we’ve always had similar slush money in our separate bank accounts after all monthly payments are made. 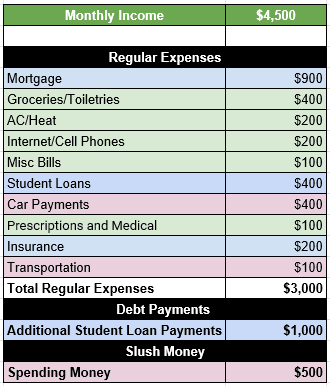 Below is a snapshot of what our income and expenses looked like back in 2012 as a duel income married couple. Keep in mind this is before we had kids or gave regularly to charity. For a more recent snapshot of our expenses after becoming debt-free you can check out this blog post. After writing down all regular expenses, extra payments, and slush money it’s time to determine who pays what expense. 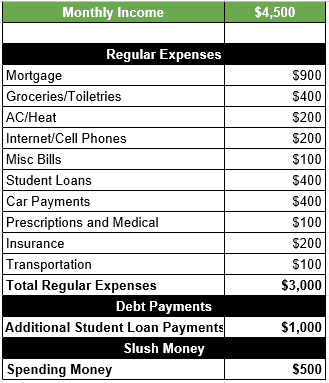 After determining the amount of slush money and additional debt paydown, we could then go back into who paid what regular expense. Usually, I paid the larger expenses such as the mortgage and debt payments. She would pay the smaller regular bills. Below is how we separated our bills back in 2012. The first question you may have is what happens if an unexpected expense comes up? This is where a small emergency fund comes into play. Since 2011, we have followed Dave Ramsey’s baby steps to paying down debt. The first step is to save at least $1,000 into an emergency fund. This will allow you to pay for the majority of unexpected expenses. If you are going to use the anti-budget approach, I’d recommend a larger emergency fund before starting to tackle debt. In 2012, we had about $5,000 in savings despite all of our debt. Thankfully we did because we had to replace our HVAC system around this time, which would have been crippling and would have resulted in more debt if we didn’t have this cushion. Because this is more of a laid back budgeting approach, having more of a cushion will allow you to respond to larger unexpected expenses. While we do not budget on a monthly basis, it has always been important for us to review our expenses, additional payments, and slush money at the beginning of every year. We’ve had several life changes during this period including two children, day care expenses, increased income through promotions, and many other events. Re-adjusting once per year allowed us to determine how much we wanted to throw towards debt and not giving or saving. It also allowed us to ensure that we had similar slush money for all of the fun things we wanted to do with our own pool of money. After six years of teaching, my wife decided to take a few years off to stay at home with our young children. They are 4-years-old and almost 11 months as of the writing of this post. This decision would not have been possible if we didn’t start to get our financial lives in order back in 2011. What seemed like a painstakingly long journey to become debt-free, came to fruition at the absolute perfect time. We paid off our mortgage in early August 2018, which was the exact month that my wife received her last paycheck. Even though she has stopped working, we decided not to move to a joint bank account. Instead, I’ve set up my direct deposit at work to where she receives basically the same amount of money per month as when she was teaching. The money that we were paying towards our mortgage, plus some of the additional payments we were making, now goes directly into her bank account. Should Your Family Have a Joint Bank Account? There are benefits to married couples having a joint bank account. However, I believe there are also benefits to having a separate bank account. In too many families only one person handles the majority of the money. Having both involved with money allows for shared responsibility. This approach may not work well if one of you is a natural spender who needs some assistance managing money. It also may not work if there is a lack of communication or trust issues. What I don’t believe is that married couples should be shunned for keeping separate bank accounts. Every relationship is different and couples should do what is best for their situation. When we started our debt free journey we did have 2 separate accounts but we eventually moved to joint account for simplicity and our decision to use a debit card. It was purely for simplyfing our finances. We’d have been just fine I guess even with separate accounts albeit the overhead of tracking. I am with you on that I too won’t accept if someone tries to force something without understanding the why. I also believe the same needs to applied to other stuff Dave talks about especially investing using a Smartvestor Pro. I am a DIY investor and I don’t buy his argument on that. Something we just started doing in January was using mint to track our spending. We linked all accounts to mint so we can do a better job of tracking certain expenses. I already don’t like it much, so we’ll see if we keep doing it. Thanks so much for commenting. I love hearing about all of the success your family has had since becoming more involved in the personal finance community! Cool post. I am wondering if this would have been better for us in the long run. We struggled with the best approach when we got married as well. The most important thing is to do what is best for your family and don’t let others convince you differently. 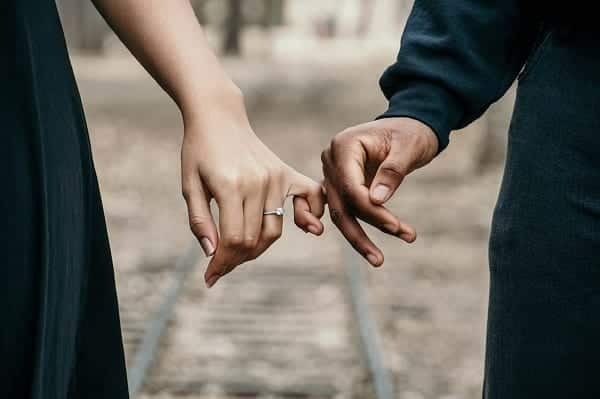 I do think it’s important for both partners to be involved in finances, so the monthly meetings sounds like a good idea. Thanks for commenting! We found that a hybrid approach works best for us. We combine most of our money in our joint account and each get a couple hundred in our separate accounts as our personal spending money. All our household expenses come from the joint account, but individual fun expenses like a new purse or pair of shoes or eating out with friends or co-workers comes from our separate accounts. 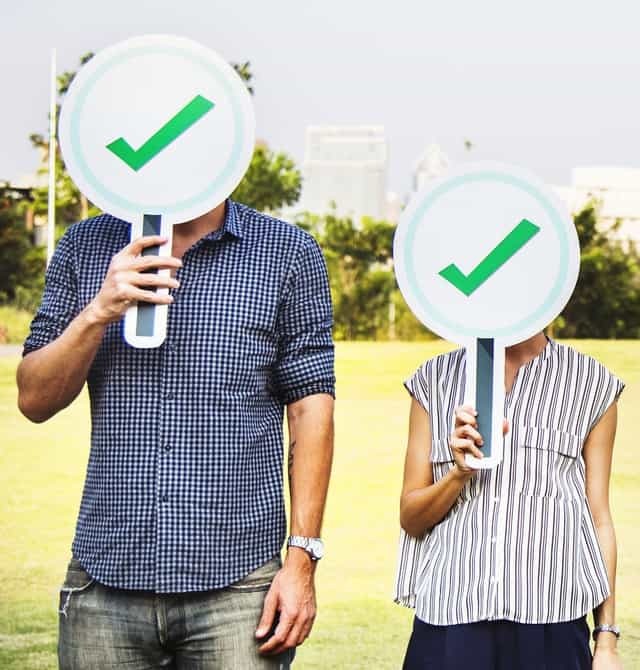 We originally tried the 100% joint account route and found very early on that having to account for every expense didn’t work for us, particularly when one of us didn’t see the value in what the other spent on. Having separate spending money has made things so much better. I’m really not sure how we’d do things if we started over today. This has just always worked for us. She’s always paid the “small bills” and I’ve paid the larger ones such as mortgage, day care, etc. In the end we always made sure our spending money was about the same. Similar to your approach except we just divided up the bills and paid from our individual accounts. Once she transitioned to staying at home it just so happened to coincide with us paying off our mortgage. So most of the money that used to go to the mortgage goes right into her account. It is a bit messy and was kind of tough to explain but it works well for us. Through two long term relationships, I’ve never had a joint bank account or financial issues. You shouldn’t need a joint account for trust and planning together. So whether you want a joint account or not, it should be a personal style choice. Agree 100%! We’ve never had trust issues with our money despite separate accounts. If anything, having separate accounts makes us both more accountable. This has got me thinking. I guess I don’t really see how this is much different than a a joint checking account with a larger “allowance” fund? Isn’t that basically the same thing? I do see cons/benefits to both approaches, but this has me curious. This is a fantastic article! Thank you! And yes, it’s not much different than what you describe. Many will pay all bills out of one account then have separate accounts for spending money. That would probably be simpler, honestly. However, I wanted to share what my wife and I have done since we’ve been married (almost 9 years). It has worked for us so many others can find benefit as well. We’ve always had separate accounts and have no problem sending PayPal requests to each other. As long as you trust your partner as a responsible individual, I don’t see why this is a problem. Fewer arguments on small discretionary expenses, more quality time together. We still talk about big purchases/investments and are transparent to each other about our individual financial situations. Sounds a lot like our situation! We don’t sweat the small stuff.